From Left: Seth and Dr Lim with a model of AraGreen Residences. They want to build a community in which multi-generation families get to live together without compromising on privacy. It is not very often that a project with a difference comes along. Developers tend to think of aesthetics and lifestyle and as a house purchaser, we get sold on this. Developers also tend to build for those who are in their prime, who are able to lead an active lifestyle. There is nothing wrong with these pursuits, from the developer's or the buyer's point of view. But there is a need to look further into the future because there will come a time when medical, social and physical support services are needed. This may be childcare services, or assistance for the elderly. These needs are very real and it takes a doctor-turned-developer to think of this. Dr Y C Lim, chairman of HSC Healthcare Sdn Bhd, went into property development with his partner Dr Soo Chee Siong and set up HSB Development Sdn Bhd. Their serviced-apartment project is located in Ara Damansara, Petaling Jaya diagonally across Sime Darby group's Seri Pilmoor. 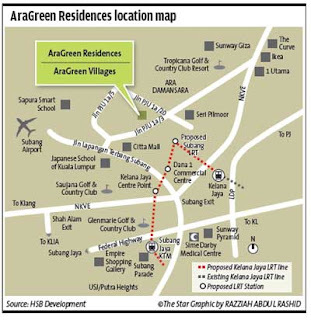 The residential portion, known as AraGreen Residences, will occupy 7.5 acres. Adjacent to it will be the commercial portion AraGreen Village. This portion will be located on 1.2 acres and comprises two buildings offering childcare and nursing services for the elderly. These services will be housed together with medical and physiotherapy service providers while the second tower will offer food and beverage outlets, convenience stores and other amenities. There will also be serviced-apartments here. Says Dr Lim: “AraGreens development is based on three pillars a multi-generational home living concept, health and wellness concept and a green sustainable concept. “We wanted to go beyond the horizons of healthcare services by building a community in which multi-generation families get to live together without compromising on privacy. There need to be designs and features to cater for both children and the elderly,” says Dr Lim. Dr Lim says very often when a developer considered a health and wellness project, the focus was only on the hardware. It was the soft components that needed to be incorporated into the property and a lot of thought needed to go into this soft part of it. “It is more than having wider doors that allow a wheelchair through, or stretcher-friendly lifts,” he says. The physical, psychological and emotional aspects plus the support and care services must all come together to make the health and wellness concept possible. With this in mind, HSB has introduced the “dual key” concept which is designed for families to stay together “under one roof” but separately. “A typical dual key home will have an ancillary unit annexed to the primary or main larger unit with separate entrances,” explains HSB Developement CEO Seth Lim. “This is especially appealing to families as they have the comfort of knowing that their loved ones elderly parents or grown-up children live just next to them. The ancillary unit is self-contained with its own living space, bathroom and kitchenette,” says Seth. He says there was always the possibility of renting out the adjoining unit, smaller unit or the bigger unit. So it was not limited to multi-generational living but also to generate income. To further promote interaction and accessibility for all the generations, AraGreens will feature 4.76 acres of community space offering facilities like jogging and exercise areas, badminton and futsal courts and pools. 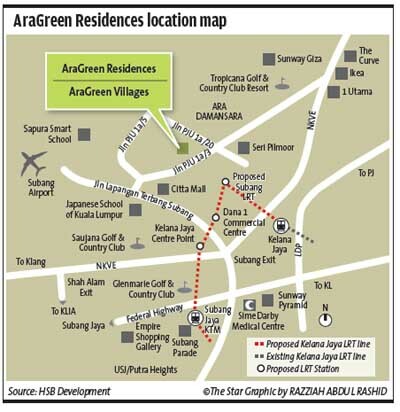 Besides being generous with outdoor open spaces, AraGreen Residences will also introduce what will be Malaysia's first Medihome (Medically Enabled Home System) a proprietary product by HSC Healthcare that enables residents to periodically check their health status within the comfort of their home. Says Dr Lim: “The MediHome System monitors the health of residents from a central medical hub located within the development. They will be able to check their health status such as electrocardiogram (ECG), blood pressure, blood glucose and oximetry, and these readings will be transmitted wirelessly to a server. “Children who are abroad will be able to access the state of their parents' health via their smart phones,” says Dr Lim. Each unit will come with these medical devices. Reminders can also be set to take medicines at required intervals and there will also be a screen to show the type of tablets to be taken. These reminders are linked to the children's smart phones so they can call home to check with their parents. Dr Lim says this would help children monitor their elderly parents even while they are abroad using technology. Besides each of the units being equipped with these medical devices, there is also the option to have the units partially or fully furnished right down to the sofa set. Dr Lim also details the fittings used. These included Grohe sanitary fittings, Duravit sanitary ware for the master bathroom, American Standard for other bathrooms, imported kitchen appliances and imported low E-glass for the facade glazing and Italian Iseo locksets. The entire development is designed with the family set up and the health and wellness of the residents in mind. The project is master planned to achieve the Singapore Green Mark (Gold Plus) and Malaysia Green Building Index to create a green and sustainable environment. Dr Lim says the company's objective was to create a mini self-contained township with the support services and amenities provided by the adjacent commerical project Ara Village. The residential portion will have six blocks of 15-storey serviced apartments, or a total of about 700 units on 7.25 acres. The company will be selling all the units in the residential portion and leasing out the commercial portion, which will also come with another set of serviced-apartments for recurring income. There will be 2.5 storeys of underground car parks. The built-ups for the standard units are between 700 and 3,000 sq ft while penthouses are between 3,100sq ft and 3,834sq ft. There are also ground floor units which come with their own private gardens. Price ranges between RM500,000 and RM2.4mil. The project is expected to be launched next month. Construction started last month and is expected to be completed in 2015. The contractor is Putra Perdana Construction Sdn Bhd and the architect is Singapore-based WOW d.lab Pte Ltd, which is part of WOW Design Group. This is HSB Developement's second project. Their first project is Menara HSC, a medical centre located next to the British High Commission. A physician, Dr Lim lived in Hong Kong for 15 years. He returned in 2000. His interest in property development and his training and experience as a doctor motivated him to come up with the AraGreen project. “We put ourselves in the place of the consumer or buyer. That was how the concept came about,” he says. When he built Menara HSC, he integrated it with the serviced-apartments, Somerset Place, which is managed by the Ascott group. Somerset enjoys an occupancy of over 90% with half of the residents being patients or their children. Menara HSC houses a medical centre for heart, eye, joints and spine.